Being an independent fashion professional can be as equally rewarding as it is exhausting. If there’s not emails to send, there’s phone calls to make, pictures to take, and most importantly, finding the time to work on your actual product. 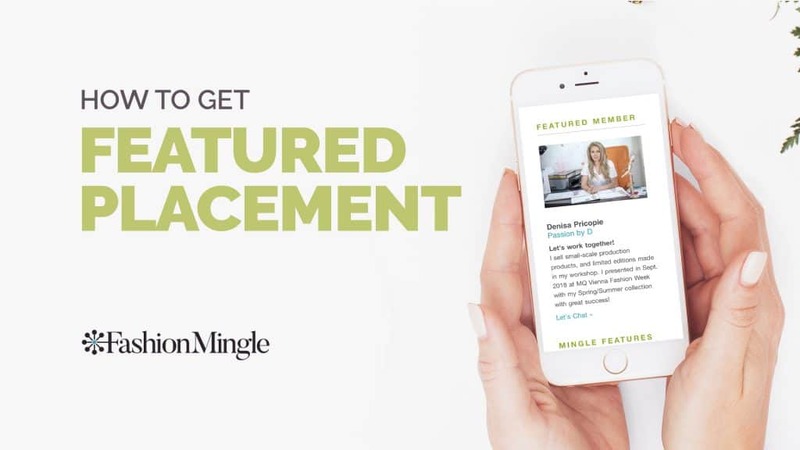 We know it’s a lot to juggle, which is why we’re now offering all Fashion Mingle members the chance to be featured in our newsletters, Instagram, and blog - for free! Not only does this help to lighten the load for you, it helps us further our mission of connecting fashion pros locally and around the globe. What Does Being Featured Include? When we select members to feature, there's a few key things that we look for such as whether or not they have an established fashion business, the quality of the services or products that they offer, how active they are online, etc. Ultimately we're seeking individuals who've invested time and effort into creating a professional brand, which includes having a completed, well thought-out profile on Fashion Mingle. Check out the video below for tips on improving your Fashion Mingle presence. What does your fashion business need right now? Be as descriptive as possible, ie "Influencers to promote my makeup brand with a minimum instagram reach of 100k for less than $1000.’ Avoid using general statements such as 'Connections' or 'To grow my fashion business’. Let readers know what they can expect if they attend, who they will meet, and why it will it be worth their time and if applicable, their money. Additionally, adding a high quality image will make your listing standout among others (reccommended image size is 1200px). Does the 'about' information on your profile accurately represent your business? Remember, this is often the first thing people read when browsing through members, and as we all know, first impressions count! If you're not sure what to write, try adding information about why you started the business, what you hope to accomplish, the services or products you offer, and anything that makes your business unique. We all know the saying - "a picture is worth 1000 words". This is ESPECIALLY true in fashion. Your profile gallery is the perfect place to showcase new products, share accomplishments, and give other members an inside look at your business. Make sure to use high resolution, professional photos that you wouldn't mind using for promotional purposes. Brandy is Fashion Mingle's Creative Director and has a zeal for adopting new trends in social media and brand promotion. Brandy manages the image and the pulse of the Fashion Mingle brand across all platforms.